When I went on the board of trustees of ACT Theatre, I knew there might be a conflict between monthly board meetings on Wednesdays at 4 p.m. and my Wednesday Walkie-Talkie hiking group, but I had no idea of how difficult it would become. This month so far I am missing three WWT hikes–Don is missing only two because he went on one without me. Feeling sorry for myself, missing those hikes, I suggested to Don that he and I could hike on Saturday or Sunday, by ourselves or with anyone who might like to join us–like the old days when we first started the Wednesday group. Yesterday, July 9, we took our first hike to a trail I had heard of but never tried, Beaver Lake Trail #629. From the hiking guide for the Darrington Ranger District, it sounded like a good choice, lightly used, easy, hardly any elevation gain. 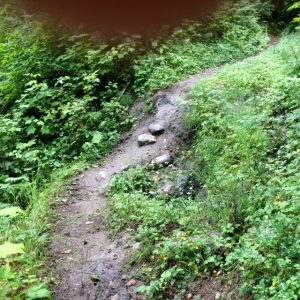 Washington Trails said, “An easy hike on an old railroad bed, this oft-overlooked trail serves up plenty of surprises.” Remember that word: surprises. The drive to the trailhead was very pleasant–I-5 north to state route 530, and then east to Darrington. Drove through the town to a T-shaped intersection where 530 went north and we went south on the Mt. Loop Highway. We passed several well-marked trail signs until 9 miles from town, just past a bridge over the Sauk River, we found the sign for the Beaver Lake Trailhead. Ours was the only car in the spacious parking lot; one spot was marked for disabled parking. The outhouse was clean and not stinky. The trail, wide and graveled, began just behind the outhouse. In a short time the wide trail narrowed to single file. Still, it seemed like a good trail, hard-surfaced dirt, wet but not muddy, with logs on the sides marking the boundary between trail and marsh on either side. We could hear the river beyond the marsh but had only occasional glimpses of white water through the trees. I was strolling along, using my poles and thinking that this would be a good level trail for the WWTs when we came to a spot where the trail dropped about four feet. There were no stairs from the upper trail to the lower, but two steps had been cut into the clay bank and then a slope beyond ran down to the lower trail. I set out, planting my poles to hold myself on the steps, when my feet slipped out from under me! I felt myself sliding down the slippery wet clay. I pedaled fast as I could to get some traction but I couldn’t stop. I hit the lower trail and kept on going until I hit the log marking the boundary and went head first into the marsh about four feet below. I remember seeing a mass of green foliage coming up to meet me. I remember thinking, I have to stop but I didn’t know how. …the log where my head rested. I was cold and wet. 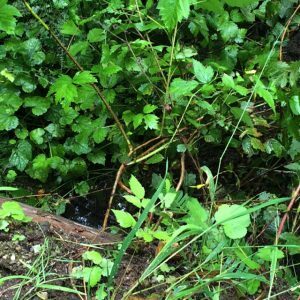 I heard Don saying, “Don’t try to move, I’ll be right there.” I lifted my head and saw a wet log with a dark brown slug on it right in front of my face. Had I hit it? My head sort of hurt, but so did my knees and my arm. My glasses were still on my face but were knocked sideways. I had lots of thoughts; first, well, I am a hiker and this is an appropriate way for me to die. Then I thought what if Don falls too and who will go for help? Then Don was there, helping me get up to my knees, and then to crawl up the side of the trail and stand up. My shoes and my legs were wet and muddy, but the rest of my clothes were dry. The marsh below the trail that I had fallen into was full of broken greens. I stood on the trail thinking first that we would go back to the car and into town for help, and next, I wasn’t hurting any more and only my pants below the knees were wet so we didn’t need help. Don just assumed that we would go on, so we did. The rest of the hike was uneventful. We found Beaver Lake which is not a lake at all but a series of connected ponds and marshes. We crossed on a sturdy bridge and went on until the trail stopped abruptly where the river had cut into the bank in 2006 and washed the trail away. It started to rain. We found a log under some trees and ate our lunch. The rain stopped, we started back. As I walked, in my head I composed the report I would post on my blog, the post you’re reading now. This really is a pretty trail. The river was wild and noisy, with lots of white water. There are heaps of moss clinging to the old trees and mossy stumps with young trees growing out of the tops. We came to the slippery slope and with my new iPhone I took pictures for the blog: the slippery slope, the log I fell over, and the marsh I fell into. I went up the slope very carefully without sliding. As we left the parking lot I suggested that we drive south on the Mt. Loop Highway so we could see what it looks like. That was a mistake. The scenery is lovely, many campers had set up tents in pull-outs from the road, but it’s much, much farther to drive back that way, past Silverton and Verlot and finally to Granite Falls. We stopped for coffee there at Buzz Inn; it used to be our coffee stop but now it’s a steak house. We shared an order of their special dessert, cubes of bread pudding deep fried and served with caramel sauce. Definitely a place to return to. We got back just in time to get into Costco before they locked the door at 6 p.m. to have the frame of my glasses adjusted. Next day I wrote this post. 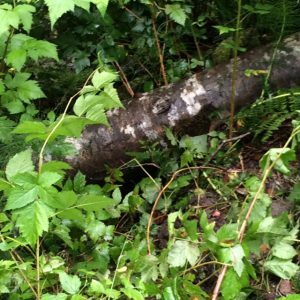 This entry was posted in Camping and Hiking Equipment, Camping and Hiking Tips, Health, Hiking, Travel, Uncategorized and tagged Beaver Lake, Darrington, Mt.Loop Highway, Sauk River, Washington Trails. Bookmark the permalink. What a story! I love your post. Miss you.